Set in northern Minnesota, The Road Back to Sweetgrass follows Dale Ann, Theresa, and Margie, a trio of American Indian women, from the 1970s to the present, observing their coming of age and the intersection of their lives as they navigate love, economic hardship, loss, and changing family dynamics on the fictional Mozhay Point reservation. As young women, all three leave their homes. Margie and Theresa go to Duluth for college and work; there Theresa gets to know a handsome Indian boy, Michael Washington, who invites her home to the Sweetgrass land allotment to meet his father, Zho Wash, who lives in the original allotment cabin. When Margie accompanies her, complicated relationships are set into motion, and tensions over “real Indian-ness” emerge. Dale Ann, Margie, and Theresa find themselves pulled back again and again to the Sweetgrass allotment, a silent but ever-present entity in the book; sweetgrass itself is a plant used in the Ojibwe ceremonial odissimaa bag, containing a newborn baby’s umbilical cord. In a powerful final chapter, Zho Wash tells the story of the first days of the allotment, when the Wazhushkag, or Muskrat, family became transformed into the Washingtons by the pen of a federal Indian agent. This sense of place and home is both tangible and spiritual, and Linda LeGarde Grover skillfully connects it with the experience of Native women who came of age during the days of the federal termination policy and the struggle for tribal self-determination. The Road Back to Sweetgrass is a novel that that moves between past and present, the Native and the non-Native, history and myth, and tradition and survival, as the people of Mozhay Point navigate traumatic historical events and federal Indian policies while looking ahead to future generations and the continuation of the Anishinaabe people. Linda LeGarde Grover is a member of the Bois Forte band of Ojibwe and associate professor of American Indian studies at the University of Minnesota Duluth. 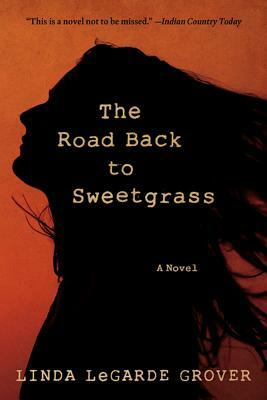 The Road Back to Sweetgrass has been awarded the Native Writers Circle of the Americas First Book Award; Grover has also received the Flannery O’Conner Award and the Janet Heidinger Kafka Prize, whose previous recipients include Ann Patchett, Anne Tyler, and Toni Morrison.